Call it what you like – RSI (repetitive strain injury), carpal tunnel syndrome, or good ol’ “keyboarder’s bane”. Everyone who types much for very long should at least be thinking about it. While I’m sure we’ve all heard the horror stories of crippling pain or numbness, surgery or lots of time off to recover, an amazingly small number of people do anything to prevent it. (Note: this, like all reviews I post, follow my review policy). Many people don’t know that the original QWERTY layout for keyboards was set up to slow down typists so keys wouldn’t stick together in the old standard typewriters. It’s a good example of a defacto standard that has long outlived its usefulness. Regardless, standard keyboards have no ergonomic thought put into them at all, and the deluge of RSI cases as numbers keyboard workers increase is an obvious proof. Kinesis Essiential. Not only did it teach me to type better and much faster, but within a month or so my wrist pain was totally gone. What’s even more amazing to me, is that after using it for 90% of my typing over the last 6 years, my wrists are still in awesome shape, and I type a ton. Hours per day. at 80+ wpm. Very impressive. So, it’s a bit funny looking. Like someone dropped a couple of billiard balls onto a normal keyboard. The dented shape of the keys mold perfectly to the relaxed hand, leaving all keys at an optimal distance from the resting position. Keystrikes are faster and more accurate, and the placement of the thumb buttons is awesome. Most people who aren’t great typists hit their backspace key a lot. I mean a lot. Or at least I did when I was learning. The thumb-activated backspace and space bar are just perfect, reducing mistakes and saving me from having to ‘reach’ for the backspace key with a weak finger like the pinky. The only complaints I have are minor. The esc and function keys are a bit small and don’t have the best tactile feedback. There is no 10-key by default, but you can buy one separately if it’s a big deal to you. The finger assignments are slightly different, like f1-f8 are left hand now instead of just f1-f5. Once you get used to it you won’t even notice it, and I’ve never had trouble adjusting back to a normal keyboard. You can even buy a Kinesis with dvorak switching ability, so you can teach yourself a much better keyboard layout. I personally have been far too lazy to do so, but I hear it’s great. Now lately I’ve been looking for a new mouse, and have been having a little strain on my mousing wrist. Thanks to an excellent suggestion from my girlfriend, I’ll be trying out the Perfit Mouse. I’ll post a review of it when I’ve run it through its paces (but probably less than 6 years). Interesting. I have been looking at ‘special’ keyboards for a while now. I use a MS Ergo 4000 and I like it, for the most part. I can hardly type on a flat keyboard; my hands are big and I don’t really touch type. 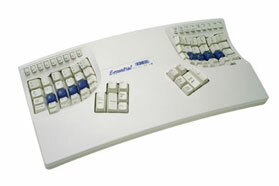 What I would really like to have is a keyboard like the MS 4000 that is split like the Kinesis Freestyle 2, but not connected with a cord between the parts (wireless maybe). There is no such animal, so I just keep on with the one I use now. A bunch of people have told me they like the Microsoft keyboards, but I could never get into them. The big difference for me is that the kinesis keyboard has the same reach distance for each key… The MS keyboard does spread the keys out of bed, but you still have to reach for the top rows of keys. I find I’m much faster on the Kinesis than any other keyboard I’ve tried, although I agree with you on the split approach – it would be great to spread the two halves out more so that my arms are perpendicular. I’m really liking the new version of Dragon naturally speaking/nuance… Hopefully voice-recognition will get so good that keyboards will only be used for coding. Let me know if you find a cool split keyboard!